Hope everyone is doing well! We have our Rock'n'Play in our living room. It's really convenient to be able to lay our little girl down whenever we need both hands. She sleeps in it occasionally, but that's with any chair, swing, etc. It was really easy to put together! I had it done in less than 30 minutes. I followed the instructions exactly! I had one bout of confusion when trying to figure out which way the legs face, but it was easy to correct once I saw my error. My two favorite things about the Rock'n'Play are 1) how easy it is to fold up and carry around and 2) how my baby essentially "rocks" herself because of the design. I only wish there was a way to have it rock automatically as well. There's been many times where my husband and I had to stay up rocking our baby girl just do that she'd stay asleep. Overall, it's a great seat! 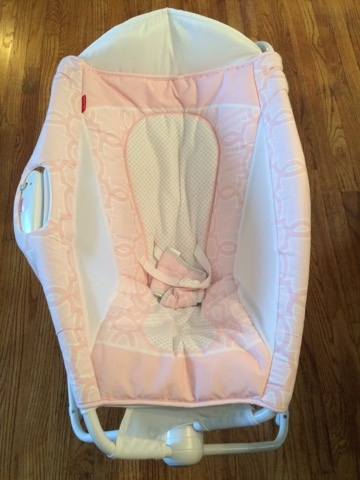 Lightweight, easy to put together, and our baby girl likes it just as much as her other chairs/swings.